My name is Johanna, you might also know me as Johis or Lhuin online. I'm a full-time freelance artist from Finland, currently based in the UK. I'm a big animal enthusiast, and I specialise in digital painting. I'm really grateful to be able to support myself doing what I love! But like any artist, sometimes you just feel the craving to discover some of your own ideas too and see where it takes you. The reason why I am on Patreon is to hopefully allocate some more time to work on these personal projects and share the process. In return for the support, I'd love to upload even more WIPs of the things I work on (commissions etc. too, contract permitting), a more in-depth description of my process and little tips, and I thought Patreon would be a great place to store them alongside with high resolution work and PSDs which I don't normally tend to upload online. I'd really like to make more tutorials and videos as well, and Patreon would help making this possible too. Sketches and doodles: Like the name says! This is stuff I don't normally upload online, and I'll be uploading some quicker practice doodles and sketches I make, even if they wouldn't make it to a finish. WIPS (high-resolution): I'll upload work in progress images of what I'm working on and explain what I'm doing, or about to do. Kind of like a self critique of the process! The WIPs will be at least 2000px wide. Hi-res finished image: 2000px wide as well, I don't upload any finished artwork anywhere other than Patreon in this size. 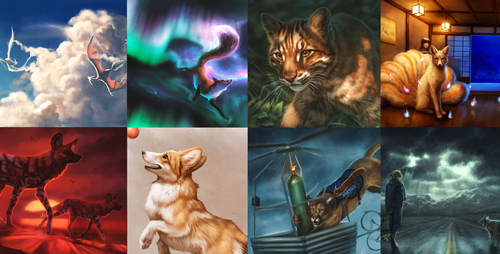 PSDs: Layered PSD-files of selected images. I will name all the layers for ease of browsing. Brushes and tutorials: First dibs into new brushes and tutorials that might not fully go online publicly. Some tutorials will also have accompanying PSD files and videos to support them. Videos: Real-time videos (so not sped up), as if from a livestream, showing the process of a painting. Commissions: Receive a custom painting of your chosen subject! If you'd like to receive just one commission, feel free to cancel the pledge anytime after the payment has gone through before you get charged again for the next month! Thank you so much for visiting my page and for your support, be it being a Patron, sharing or having a look at my work! Thanks so much for the support! Here's a little insight into the process. A bit more in-depth view! • Different kind of videos! These could be to supplement tutorials, real time drawing videos (narrated or not) etc. The same as the Cross Fox tier, BUT with a monthly critique benefit! You can submit one image per month and get feedback on it with a PSD redline/suggestions. - A surprise Print Pack shipped to you! Consisting of one A4 (8.3 x 11.7) and one A5 (approx. 6 x 8) print that I'll choose for you, signed in the back. - Shipping address required, your personal information will only be used for shipping purposes and you're more than welcome to just pledge once. - Also includes all previous tier rewards. If I reached this goal it would pay off a good chunk of my monthly living costs, which would allow me to focus on even more personal projects!